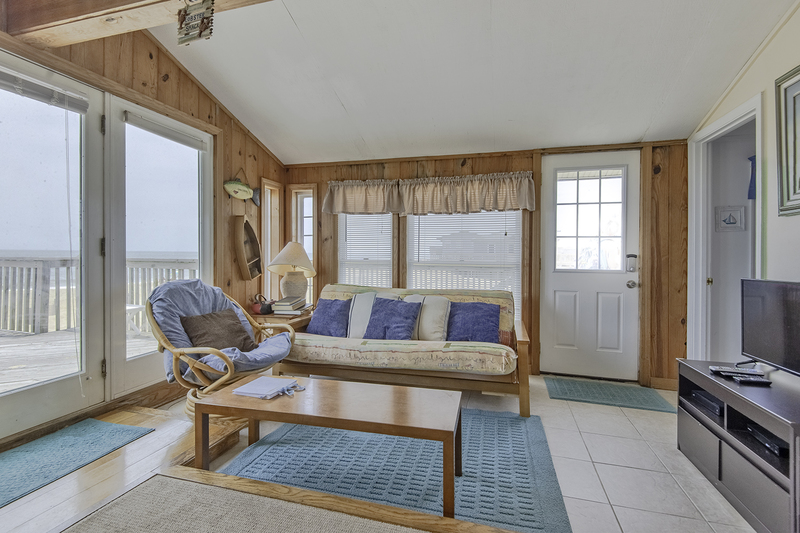 This traditional Kitty Hawk Beach Cottage is very comfortable, nicely decorated, & offers magnificent Ocean & Beach Views. Situated just above the Beach this is a great place to relax & watch the waves roll in. Perfect for a small family vacation or a Beach Getaway in any season. Shopping, Dining, & SeaScape Golf Links are nearby. Ground Level: Parking for 2 Cars, Steps to Entry, Enclosed Outside Shower, Charcoal Grill, & Fish Cleaning Station. 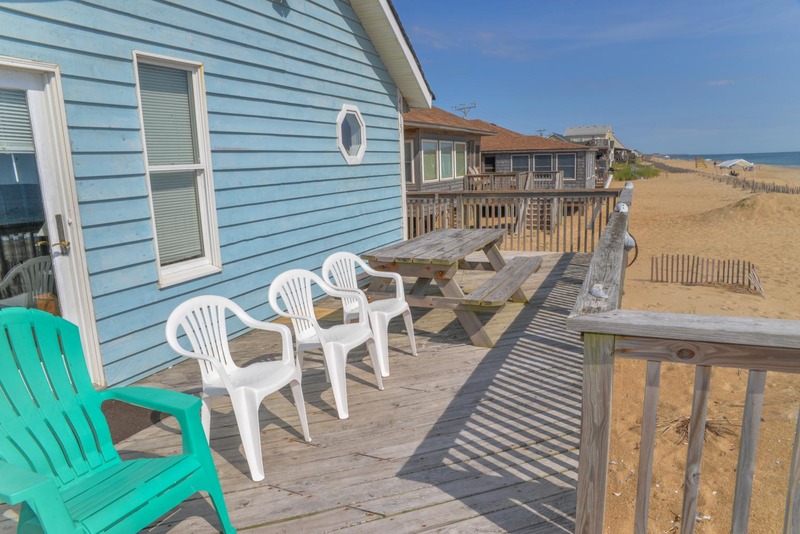 Main Level: Living/Dining/Kitchen Area, TV/VCR, DVD, Fantastic Ocean & Beach Views, 3 Bedrooms (1 w/Queen, 1 w/2 Singles, & 1 w/Bunk w/Trundle), Full Bath (Shower Only), Half Bath (Located Between Single & Bunk Bedroom), & Sun Deck w/Furniture. Features include: C/AC & Heat, Microwave, Phone, TV/VCR, DVD, Wireless Internet, & Ceiling Fan. No Pets. Love the deck!! Makes the house so special. I absolutely loved the deck. I have been to the outer banks many many times and I think this is one of my favorite decks. The house was adequate for what we were looking for. Nice and cozy. Well stocked. The deck was awesome and we enjoyed watching the sun rise in the cute chairs. This is a wonderful place for a vacation. We have enjoyed this house and deck many times. Very well stocked and comfortable. Can't beat the location. Definately take a walk to Art's for the burgers, they are amazing. Perfect place to eat the night you get there. The cottage is very well stocked and the owners have wonderful games and beach supplies that make your stay even better. Great spot to go fishing.